I love to read. I always have. Some of my earliest memories are going to Bookstop (RIP) with my mom and picking out new Baby-Sitters Club books. Now as a 34 year old wife, mom, and full time blogger, finding time to read can be tricky. I’m going to go into how I make time to read because I know so many of us struggle to find that time. At night: I try to read before bed every single night. Even if it’s for 20 minutes. Sometimes I will get 10 minutes in and my eyes just close. But if I can read a chapter a night I am happy. Bonus, I find when I read before bed I sleep better. At the gym: So this may sound weird but I do sometimes read at the gym. When I’m biking or on the elliptical I will read books on my phone. I have the books app and I usually keep a few on there. I find it makes the time go faster. Driving/Audiobooks: Obviously I don’t read while I drive, but sometimes I will listen to an audiobook. It’s not at all my preferred form of taking in books, but on a long drive it can be quite enjoyable. When Liam naps: If I need a break from work, or I am tired/having a rough day, I will use Liam’s nap time to read. This is rare for me but even if I read for 30 minutes during his nap-time I feel like it gives me the break I need. Waiting Rooms: When I have a Dr appt or a meeting or anything of the sort I always take my iPad because I am usually early or someone is late and that gives me time to read. I am always glad I do this when a Dr office is running behind and I find myself with an hour to read. Flights/Trips: I always always read on flights instead of watching a movie. Unless I am really really tired. Since I don’t have internet to distract me (I never opt for in-flight internet) it’s a good time to read. Also if Andrew is driving and we are on a road trip I will usually try to read. Doing these things gives me an extra few hours to read at least each week! Sometimes a lot more! Carving time to read is a challenge but I read before going to bed. We all need to read more. I’ve never thought about reading at the gym. Such a good idea & a great alternative to the social media scroll! Yes, naptime! I too use that time to settle with my beloved books. It allows me to keep an eye that my LO stays in bed until he sleeps and gives me a break. I always complain about not having enough time to read. I think I will follow your footsteps! I always find myself having to schedule some reading time before bed because otherwise I’ll get stuck on my phone. On the weekends I love reading for a bit during the quiet mornings before everyone is awake! I used to love reading…and I still do…but I find the second I try other things always get in the way! Loved this post!!! I’m not a mom but I work full time, work on my blog regularly & spend quite a lot of time in my car, so it can be quite tricky to get plenty of reading time during the week. My weekends are sacred so I always make sure I have a couple of hours to read. During the week I usually read for about half an hour before closing my eyes. I also try to read when I’m up in the middle of the night nursing. It can be such a difficult time or little to no sleep, but I also have such good memories of that sweet time with my daughter! I really need to get into audiobooks. I feel like I spend so much time listening to music I’m honestly not even thrilled with. Loved this post. Had some really good ideas! I love to read and agree that it is so hard to find time to “just” read! I live in NYC so I try to read while commuting on the subway or any other type of public transportation. Oh gosh, I wish I could read in the car – as a passenger! But I get motion sickness. I do try and bring a book with me when I go places though, because sometimes you end up waiting! Great ideas for fitting in reading. Before kids I read all the time, now it is hard to finish a book. I find that I am so tired I usually fall asleep while reading. I am with you on audio books, they’re good for a long drive but I find that my mind ends up wandering during them so I never really hear the book. It’s funny how when I was a kid I devoured books like none other. I am grateful to my parents for raising me to love books. Now, I am great at encouraging my son to read and making our home a book rich environment but I don’t really nearly enough. These are great tips!!! Aww, good ol’ Babysitter’s Club. I’m pretty sure I read every single one. 🙂 I have really struggled to find time to consistently read since becoming a mom. I used to listen to audio books on my way to and from work, and I still did that when baby #1 was little and I was running errands. But that doesn’t work now…someone wants to talk to me all the time! Right now I have a nursing baby, so I sometimes read while hiding in the nursery feeding him. Having the Kindle App on my phone is the ONLY way I get reading in. It’s my goal in life to read everynight before bed, and I fail at all the time. Thanks for the extra push and motivation. I am a reader oo. I ave an ancient (now) IPad1 that has the Kindle app on it, and take it everywhere. I think my favorite time to read though is in bed. I have cats, and one in particular I think can read or likes to (yeah I am nuts ha!) He will tap the page if it dims on me. He also loves it when I read to him. He is a bit odd too. I dont think he minds the genre although I read mostly mystery & suspense or horror. Great reminders! 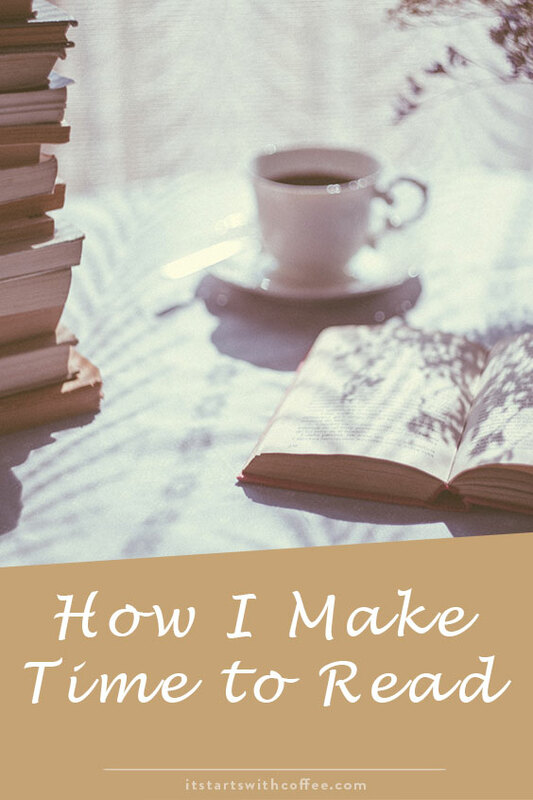 I love to read and sometimes when you’re blogging and all you do is blog all day, it’s easy to forget to just pick up a book! I’ve never been an audiobook person but recently I started using audible to try and work in some time to “read” while I drive. It’s been so helpful! I read 2-3 hours before bed and when I’m in waiting rooms too. I find it hard to read on trips or when I commute. I definitely want to give audiobooks a try! There are a few books I’ve been wanting to read so I may give audible a go. I definitely need to make more time to read. It is so relaxing. I need to ditch some binge tv time once my daughter falls asleep! I find time to read before I go to bed. I make it a habit to read two to three chapters of a book before I sleep. I rarely have time during the day so my reading schedule is before bedtime. I follow a lot of the same trucks that you mention. Reading before bed is an absolute must. I also bring a book to work and read during my lunch hour. I can usually finish a book a week that way! People ask me how I make time to read all the time! With three kids, a husband, a full time job and a farm, reading time is sparse. I know it’s not good for my eyes, but I read on my phone most of the time using the kindle app. Because… I can read while waiting on lines, lunch breaks at work, doctors offices, and in the car when I’m not driving. It’s easier to hold my phone and one kid at the same time rather than a book. I miss hard copies though, but I’m more limited with read time that way. I read on the way to work, before sleep, during lunch break. We also have reading time together, when everyone spends 30 minutes with books, including our toddler daughter. LOVE these tips! Thanks for sharing. I do all of these, too, except the reading multiple books at once – I just can’t do it unless one is nonfiction/anecdotal and the other is a fiction novel. You provide great tips for me.. I love to read too and these are great ideas! I work from home and pretty busy. However, I will find time after I get off of work before my children get home from the bus. I also wake up early in the mornings and will try to read after meditation. I also read at the gym as well. And definitely before bed while in bed. I love to read, been reading sense middle school and now as I gotten older it’s all I want to do.